My new fabric is now available! These two are called Sunflowers and Stripes, available here. How did we think of such brilliant names, you ask! They're printed in one color, chocolate brown on natural canvas. All of the fabrics are decorator weight, 54" wide 100% cotton. To download the line sheet PDF for all Jessica Jones fabric, click here. For wholesale orders, contact JCaroline. yeah! congrats on another line! I especially love the third one down. Combined with some nice chocolate brown fabric, it would be divine! Hooray! I can't wait to buy some! I think those sunflowers will be my summer pillows next year. Perfect for here in Kansas! Congrats on the new line! I love it... especially the orange one. PAY UP! Just kidding. I'll see what I can do. You're lucky you're related to me and I like you. Just finished checking out over at JCaroline and will now be watching the mail box expectantly. congrats on another awesome line! Love it all!! Yippee!! Yeah! So glad it is ready! Off to purchase more fabric! The fabric is great, Jessica. Congrats! Oh, it looks amazing. Congratulations! The fabrics are beautiful. So unfortunate that I have to pay a high custom fees for fabrics purchased online else I will be buying up the fat quarters. Congratulations, your fabrics are so lovely. So fun, bright and cheerful. I love the design inspiration you provided for JCaroline and she had some of her own great quips. Congratulations! I love the new fabric. And you have to admit, the crocs do look adorable with the jumper that caroline whipped up! Holy moly, it's AMAZING! Congrats! I can't wait to see all the fun things people make with it. Thanks for making such great designs... Have a good weekend! I love your designs..they are fabulous! Awesome!! And I love the jumper that Caroline made: it's adorable and chic. ~ Congrats from one of your many fans. BTW though you would like this link as you love things orange and love design.. Thanks, guys. SCIJ, nice link. Portia, I can't wait to see! Gorgeous! Congratulations. I need some of that boardwalk fabric for my living room. i like those, how neat! On the quilt-weight...the only thing I have ever quilted was a (ONE) potholder. I just love the idea of doing a to of other things with it. Although I am quite impressed with Jcaroline's jumper for her cutie. I LOVE your color choices and fun designs. Thanks. wow, those are just great! congratulations! um. have you seen this? when i look at your blog, your design "sunflower and stripes" looks black to me...but when i look at jcaroline site...it is brown..weird huh. The sunflower and stripes color is a VERY DARK brown. I've seen it in person and thought it almost looked black. 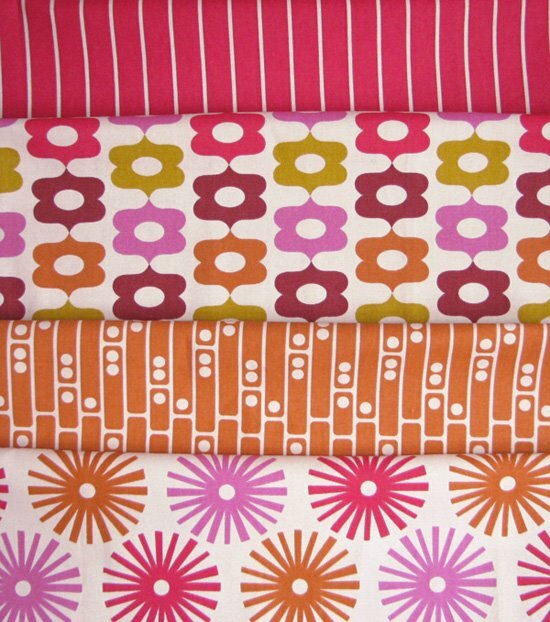 I just ordered Calliope and Orange Boardwalk to make reversible placemats. Might even make them with vinyl like the coasters you posted. So excited to have some of your work in my home. Goes perfectly with the Danish modern chairs with original orange vinyl I just bought. Larissa, I hadn't. LOVE IT! But why's he dissing InDesign?? I went into a local (okay, somewhat local... I live in the boonies) fabric shop in MPLS a few weeks ago and was super excited when I saw your Modern Flora fabrics being sold there! I LOVE IT! I love the patterns and the colors of these fabrics! I just bought a whole bunch of your fabric, i'm sure it will look oh so great at my new ap. Keep up the good work girl that i'll keep up visiting an supporting you! Congratulations, they are just gorgeous. 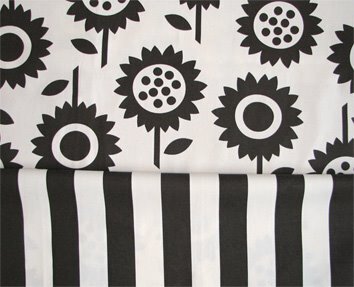 I wish I was crafty and I wish I was pregnant b/c I love the sunflower fabric and want to make baby bedding with it!! They're all beautiful, thanks for sharing! Beautiful! Can't wait to buy some!! Unfortunately, jcaroline still does't want to ship in Canada at a reasonable rate. Very disapointing. I will have to wait for another retailer. What an awesome color combination and the designs are to die for!!! Plus, I had never been to JCaroline site - woO-HoO!! Jessica, I don't know! i'm so out of everything I've never even used InDesign. And the last time I had my hands on Freehand was...man...like, 9 years ago. I guess it died. Got it today and love it even MORE!